Mazda There are 15 products. 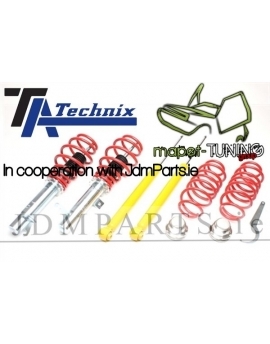 Coilovers TA-technix for: Mazda MX-5 Exact specifications:models: NAyearbooks: 1989-1998max. load in kg (front): 620 / max load in kg (rear): 645The set includes:Complete suspension adjusted to a specific model, the key for height adjustment,warranty document, proof of purchase (receipt or invoice). 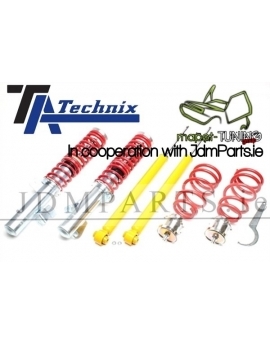 Coilovers TA-technix for: Mazda MX-5 Exact specifications:models: NByearbooks: 1998-2005max. load in kg (front): 620 / max load in kg (rear): 645The set includes:Complete suspension adjusted to a specific model, the key for height adjustment,warranty document, proof of purchase (receipt or invoice). 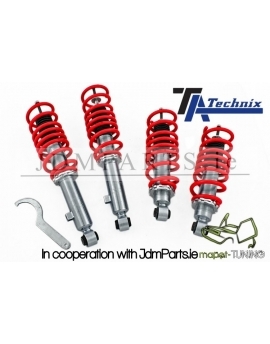 MAZDA 3 BK 09/2003 - 2009 TA-TECHNIX COILOVERSmax. 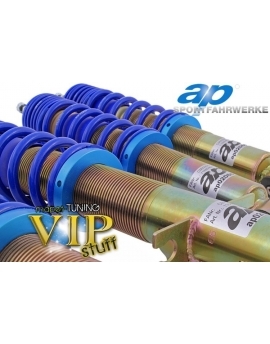 load in kg (front): 1110 / max load in kg (rear): 1075The set includes:Complete suspension adjusted to a specific model, the key for height adjustment,warranty document, proof of purchase (receipt or invoice). Exact specifications:models: Jasma / JBSMyearbooks: 1998-2003 max. load in kg (front): 860 / max load in kg (rear): 750 The set includes:Complete suspension adjusted to a specific model, the key for height adjustment,warranty document, proof of purchase (receipt or invoice). 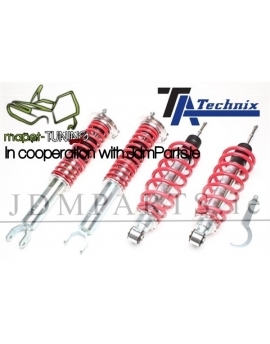 Coilovers TA-technix for: Mazda 121 (fork) Exact specifications:models: Jasma / JBSMyearbooks: 1995-1998 max. load in kg (front): 860 / max load in kg (rear): 750 The set includes:Complete suspension adjusted to a specific model, the key for height adjustment,warranty document, proof of purchase (receipt or invoice). 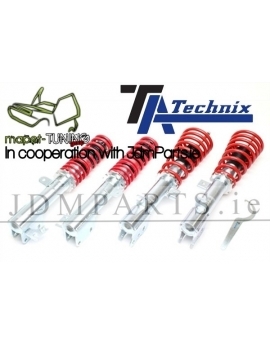 Coilovers TA-technix for: Mazda 2 Exact specifications:models: DY max. load in kg (front): 900 / max load in kg (rear): 800 The set includes:Complete suspension adjusted to a specific model, the key for height adjustment,warranty document, proof of purchase (receipt or invoice). 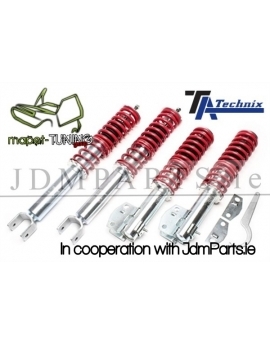 Coilovers TA-technix for: MAZDA 323 / 323F Exact specifications:models: BJ / BJD max. load in kg (front): 960 / max load in kg (rear): 890 The set includes:Complete suspension adjusted to a specific model, the key for height adjustment,warranty document, proof of purchase (receipt or invoice). 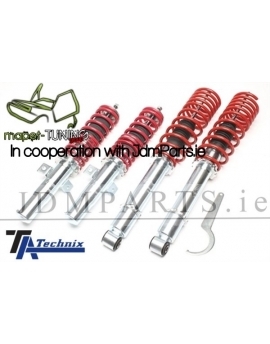 Coilovers TA-technix for: Mazda RX 8Exact specifications:models: SEvintages: 2003 - 2011max. load in kg (front): 860 / max load in kg (rear): 1030 The set includes:Complete suspension adjusted to a specific model, the key for height adjustment,warranty document, proof of purchase (receipt or invoice). Exact specifications:models: EC1991 - 1998 max. load in kg (front): 895 / max load in kg (rear): 710 The set includes:Complete suspension adjusted to a specific model, the key for height adjustment,warranty document, proof of purchase (receipt or invoice).